Vote for us to win $125,000 in the Powerful Choice Challenge! We have some exciting news to share! 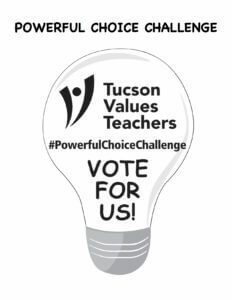 Tucson Electric Power selected Tucson Values Teachers as one of only five local non-profit organizations to compete for $125,000 in TEP’s Powerful Choice Challenge. The 10-day challenge kicks off at 6 a.m. on Monday, Oct. 16 and ends at 6 a.m. on Wednesday, Oct. 25. Anyone who lives or works in Pima County and is at least 18 years old is eligible to vote online once per day at www.tep.com. This competition is in honor of TEP’s 125th anniversary and Tucson Values Teachers—if we win—will honor 125 local educators with classroom grants to empower their students with “Light Bulb Moments.” These teachers will be selected through a community nomination process and in addition to the $500 grants, will receive public recognition for their commitment to the profession. We’re excited about the possibility of highlighting the professionalism and dedication of teachers in Southern Arizona but we need your help to make it happen! Vote for Tucson Values Teachers every day from Oct. 16 to Oct. 25 at tep.com. Share and like our social posts about the Powerful Choice Challenge to your friends and followers! We’ll be posting to Facebook, Twitter, and Instagram. RSVP to our Facebook event to receive a notification at the start of voting and other Powerful Choice Challenge updates. We’re looking forward to starting the Powerful Choice Challenge on Oct. 16 and appreciate your commitment to local educators and their students! Download a PDF of our Powerful Choice Challenge Light Bulb Moment coloring page!